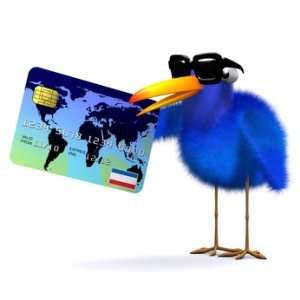 We all know what credit card numbers are, but what do they mean anyways? Credit cards generally have 16 numbers and for most of you the only time you ever pay any attention to them is when you are entering them online for a purchase. These are not 16 random numbers, credit card numbers do have a rhyme and reason to them. All Visa credit cards have a first number of 4, all American Express cards begin with a 3, all MasterCard numbers begin with a 5 and all Discover numbers begin with a 6. The first six digits of your credit card number are called the “Issuer Identifier” numbers, these numbers identify who exactly you have the card with, since there are 10 possible numbers [0-9] and 6 different numbers there are exactly a million different combinations that could form the issue identifier numbers. The seventh digit on your credit card until your next to last digit are called the individual account identifier numbers. Obviously this identifies your individual account at whatever credit card company you deal with. These numbers are going to be completely random in most cases, there are 10 to the 12th power number of different combinations for these numbers, also called 1 trillion different possibilities, so scammers are wasting their time if they try to guess your numbers, as long as you keep your credit card to yourself and you do not do anything stupid no one should ever know your credit card numbers other than yourself. The last digit on your credit card is called the check digit. Now you know that credit card numbers are not completely random, do not be “freaked out” if your first couple of numbers match a friends or family members first couple of numbers, you likely just have a credit card from the same company. Let’s talk about credit card security codes, you likely already know what they are because most online purchases require you to list your security code. The card security code can be found on the back of your card in a three number grouping if you have a Visa, Mastercard, or Discover credit card. If you have an American Express card the security code is on the front of the card printed above the last couple of credit card numbers on your card. When you make a face to face transaction with your card your security code is a non-factor because it is not included on the metal strip of the card, your security code plays a much bigger role when you make purchases online. You need to value your credit card numbers. Online phishing scams are becoming more and more popular, a scammer sends you an E-mail from what appears to be your bank or credit card Company asking you to enter your numbers for verification. While these scams are easy to fall for you can avoid them. Never follow any links from your E-mail account to a webpage asking for your info, this will be a scam more likely than not. Credit card companies will send you E-mail’s regarding your account and your monthly statements but they will never ask for your numbers or anything like that. Also it is important to generally be cautious with your numbers when at all possible, it is better to be safe than sorry!